This is a great article from the Portland Press Herald, discussing gardening. Our General Manager, Mike Comer, is interviewed. and global warming fuel a planting revival. The family vegetable garden is making a comeback. Mainers who haven't had dirt under their fingernails for years, if ever, are turning soil and planting vegetables, according to suppliers and extension agents. And experienced green thumbs are expanding, sometimes even into the front yard. "I think it's kind of the return of the Victory Garden," said Diana Hibbard, home horticulture coordinator at the University of Maine Cooperative Extension office in Cumberland County. While Victory Gardens were a mark of patriotism during World War II, plots of homegrown veggies have become far less common in the age of supermarket produce aisles filled year-round with vegetables and fruits from around the world. 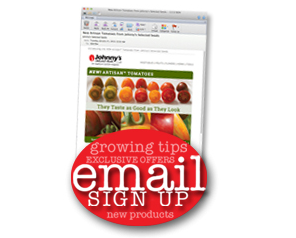 This year, however, seed dealers have been surprised by a surge of orders, community gardens have started waiting lists, and gardening and canning classes are filling up. "We're getting a lot more calls. People want more information," Hibbard said. "I think a lot of people are going to try their hand at growing, freezing and preserving." Hibbard and others attribute the revival to concerns about pesticides and contaminants, global warming and energy use, and rising food prices and financial belt-tightening. Some also said that good weather has energized would-be gardeners. "It's kind of a coalescence of a lot of different factors," said Elizabeth Radliff of Fedco Co-op Garden Supplies in Waterville. Fedco's seed sales jumped about 20 percent this season, the biggest increase since 1999, when the Y2K scare had people worried about computer malfunctions and economic disruptions, she said. Coast of Maine Organic Products has seen a 30 to 40 percent jump in sales of its Quoddy Blend, a compost mix made from lobster waste that's a favorite for vegetable gardens, said Carlos Quijano, president of the Portland-based company. The University of Maine Soil Testing Laboratory, which offers $12 soil tests that are recommended for new gardeners, has had a 43 percent increase in test requests so far this year, said Bruce Hoskins, coordinator of the program. At Yarmouth's Community Garden, coordinator Marjorie Stone squeezed in several more plots and has started a waiting list. "Now I have 134 plots. This is the biggest year we've ever had," Stone said. "I don't think I've ever gone over 125 before, but people kept calling. Last year, I had plots left in June, and this year, I was scrambling to find plots in April. We've never had a waiting list before." Kerry Gallivan and his 5-year-old daughter, Shanti, planted their first seeds -- a row of peas -- at the community garden on Wednesday. For Gallivan, the new garden is the ultimate way to eat local, organic food and spend quality, educational time with his family. "Shanti was just getting to the age where she was wanting to go gardening," he said. Nearby, Joanna Moody, another first-timer, laid out her plot for herbs and peas, some of which she plans to freeze. "I love peas," she said. "Right now, I'm on a tight budget and I can't buy fresh vegetables." Moody and others said they also like the community part of the town gardens, including socializing, picking up pointers and helping to grow vegetables for food pantries and families in need. Jill Richardson and her boyfriend plan to start planting lettuce and onions in their new plot this weekend. "I think it's better for me, health-wise and for my wallet, and probably just fresher," she said. "I think it does pay off in the long run. Organic food is really expensive." But more than saving money, she said, "I work 8 to 5 all day in an office and I'm looking forward to getting outside." Experts warn that vegetable gardens don't necessarily save money, especially new gardens. But experienced gardeners who put in a lot of time and sweat certainly can come out ahead financially. Roger Doiron lives on a third-of-an-acre house lot in Scarborough but grew six months worth of vegetables in the backyard last year for $85 in seeds. "Pretty much from June on we were just eating our vegetables," he said. Now, he's expanding and planning to dig up part of his front lawn for another small vegetable garden. "There is a little bit of a front-yard garden movement," he said. Doiron is happy to see the gardening resurgence and has even started a Web-based campaign to re-establish a vegetable garden on the White House lawn, in the tradition of Eleanor Roosevelt's Victory Garden. His idea, posted as "Eat the View," is rated the most popular suggestion on www.ondayone.org. "It suddenly makes sense again," he said. While it's clear that more people are planting more vegetables this year, it's an open question how many new gardeners will stick with it after a season of weeding, watering and fighting pests. "There are going to be some that find out it's harder work than expected, and there's going to be some that keep right with it," Hibbard said. "It becomes a fever when you get into it. (Gardens) are very therapeutic." Next year, at least, suppliers will be ready. "It was pretty much a surprise. 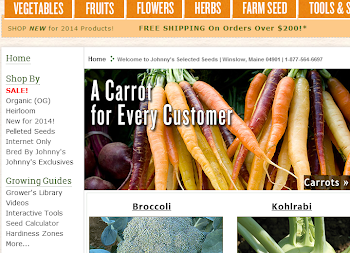 We didn't plan for it," said Mike Comer, general manager of Johnny's Selected Seeds in Winslow. "We'll plan for it next year." Comer attributes much of this year's demand to fears about the food supply and reports of a global food crisis. It's hard to guess if that will be a factor in a few years, he said. "As long as the food supply remains safe and stable I'm a little bit concerned about how long the enthusiasm for gardening will last among people getting into it for the first time." But, Comer said, he expects some will stick to it. "We're increasing our production for the next two to three years, so we're expecting this to continue." I enjoy all of the different parts of gardening – choosing what to plant, deciding when and how to plant it, tending the garden through the summer, and the reward of harvest. We’re experimenting with some Italian varietals that we aren’t usually able to get, and look forward to seeing how they turn out in the months ahead.